ASRock Launches Phantom Gaming X Radeon VII 16G Graphics Card Performance Advanced for Gaming and Creation by World's First AMD 7nm Gaming GPU. 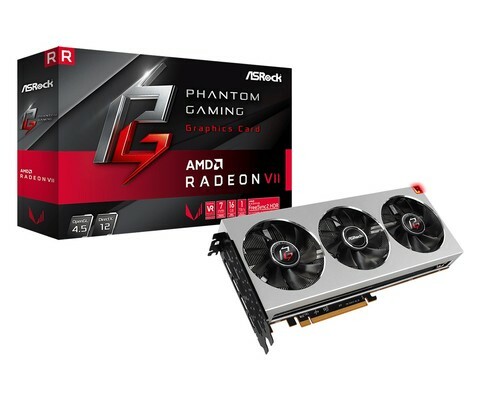 The leading global motherboard, graphics card and mini PC manufacturer, ASRock, launches the flagship level product - Phantom Gaming X Radeon VII 16G graphics card, featuring AMD's world's first 7nm Radeon VII gaming GPU and 16GB 4096-bit HBM2 memory with powerful computing performance, plus full instruction set support such as DirectX 12, OpenGL 4.5 and Vulkan for the latest AAA-rated games, virtual reality VR, 3D rendering and video editing applications, and next-generation computing workloads. It provides a great experience for enthusiast gamers and professional creators. The Phantom Gaming X Radeon VII 16G graphics card is equipped with the Radeon VII gaming GPU built on the latest 7nm process technology based on the next-generation Vega architecture, achieving a base/boost frequency of 1400/1750 MHz and with 16GB 4096-bit HBM2 memory which is twice the capacity of the previous generation Radeon RX series, while the 1TB/s maximum memory bandwidth that is 2.1 times of the previous generation. The average game performance increased by 29 percent, and the average content creation efficiency increased by 36 percent compared with the previous generation Radeon RX series. With the increased architecture and performance, coupled with the support of DirectX 12, OpenGL 4.5, Vulkan, and the latest Radeon FreeSync 2 HDR technologies, enthusiastic gamers can enjoy the seamless, high-refresh HDR gaming experiences at highest resolutions; creators can also run the next-generation photo and visual creation applications on the 8K monitors. In addition, the card uses a triple fan design to optimize the heat dissipation, ensuring a long-time, stable operation. It also has three DisplayPort 1.4 and one HDMI 2.0b ports to support up to four displays for multi-monitor output that can deliver a greater flexibility in use for gamers and creators. Specifications may vary without notice. Overall, ASRock Phantom Gaming X Radeon VII 16G graphics card is equipped with AMD Radeon VII - the world's first 7nm gaming GPU, and 16GB large capacity 4096 bit HBM2 memory, to provide a powerful and comprehensive performance for gamers and professional creators with the latest process and technologies. The bundled activities of the three AAA games also bring a higher added value. From this point of view, ASRock Phantom Gaming X Radeon VII 16G graphics card is undoubtedly an excellent choice in the current flagship graphics cards.